Accused hostess Terraniqua Snow was the only adult who didn't have an arrest record before the party. It was quite a party at the Homewood Suites hotel in River North early last Sunday. Three handguns were recovered in room 918 after shots were fired around 3:30 a.m, police said. Ten adults were arrested along with two minors, almost all for trespassing. No one was charged with any gun crime. Now, the CWBChicago team has pulled up the police and court records of the attendees. It turns out the ten adults—average age 21.4 years—had collected 48 arrests in Chicago. And that was before last weekend’s shenanigans. Four of the ten adults have firearms convictions and a fifth is awaiting trial on gun charges. One of them is on parole. 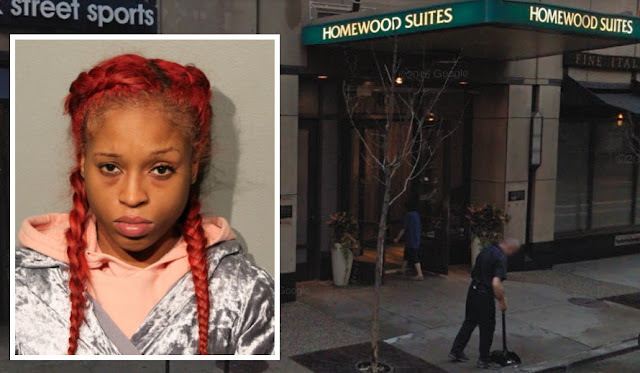 No one has been charged with any weapons violation in the hotel incident, which reportedly sent a bullet flying through “common walls” between guest rooms. The partier with the most extensive history is 21-year-old Teron T. Gulley-Clark. Arrested 16 times since he turned 18, Gulley-Clark received a one-year prison sentence for aggravated unlawful use of a weapon last July. He was paroled six weeks later. He is charged with trespassing in the hotel caper. Close behind Gulley-Clark is 23-year-old Terrion Morris, He has 11 adult arrests and has been on probation for narcotics since January 18. Last December, he received a one-year sentence for aggravated unlawful use of a weapon, records show. Since then, charges of failing to register as a gun offender have been thrown out of court twice. He is now charged with trespassing in the hotel case. Become a CWBChicago sponsor for as little as $4.08 a month. Receive exclusive reports and services. Terence Vickers, 22, has seven adult arrests. In April 2016, he received a one-year sentence for unlawful use of a weapon. He’s currently awaiting trial for criminal trespass to vehicle in the 7th police district. He is also charged with trespassing at the hotel. Twenty-year-old Caleb Roby has busily amassed six arrests since turning 18. He’s awaiting trial for unlawful use of a weapon and possessing a firearm without a valid FOID card. Separately, he is also awaiting trial for criminal trespass to vehicle. In an October firearms arrest report, police identified Roby as a member of the Four Corner Hustlers street gang. He’s charged with trespassing at the hotel. Rounding out the top five arrestees is Shamond Armstead, 23. He has five adult arrests, according to police records. In 2013, he received a two-year sentence for a gun violation. This summer, Judge James Obbish found him not guilty of six firearms charges in a bench trial. Police identified the party hostess as 24-year-old Terraniqua Snow of Garfield Park. She was the only adult in the room who had never been arrested before last weekend’s party, according to police records. That status has changed, of course. She was charged this week with misdemeanor reckless conduct and two misdemeanor counts of contributing to the delinquency of a minor.